Do you have space for a playroom in your house? We don’t, but I have come up with a way of making the space, by putting Ava and Thea in the same shared bedroom with bunk beds. Until last week, Ava (7) and Thea (5) each had their own room. 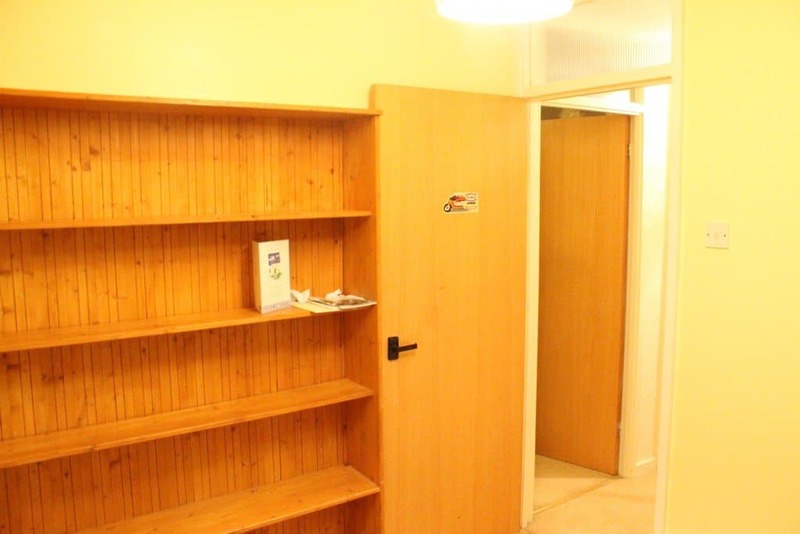 Ava’s was a large double, whilst Thea’s can only be described as a box room. I’ve been thinking about putting them in the same room for about six months but was worried they would fight, or not sleep. 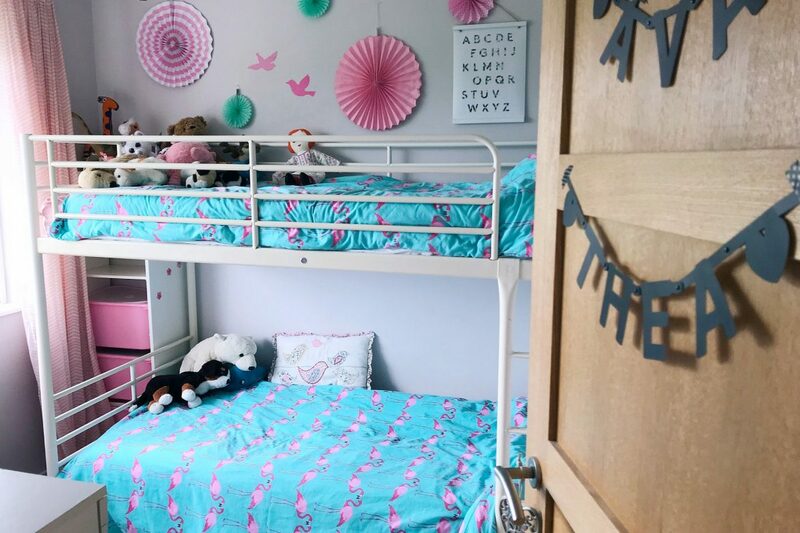 My sister and I used to have a shared bedroom with bunk beds, and we loved it. I hope our girls will like it just as much, and am fairly confident they will, as they are such good friends. I initially considered putting bunk beds in Ava’s big room. 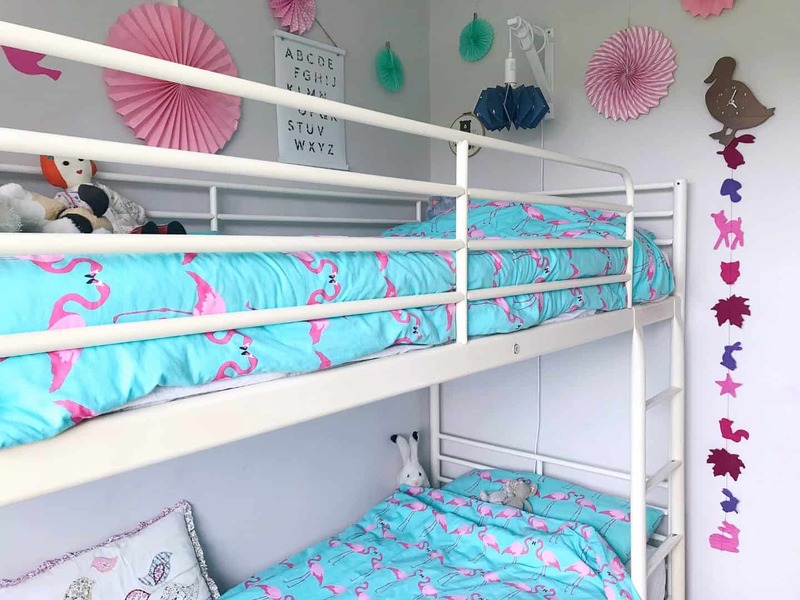 Then I realised it made much more sense to create a shared bedroom with bunk beds in Thea’s small room. 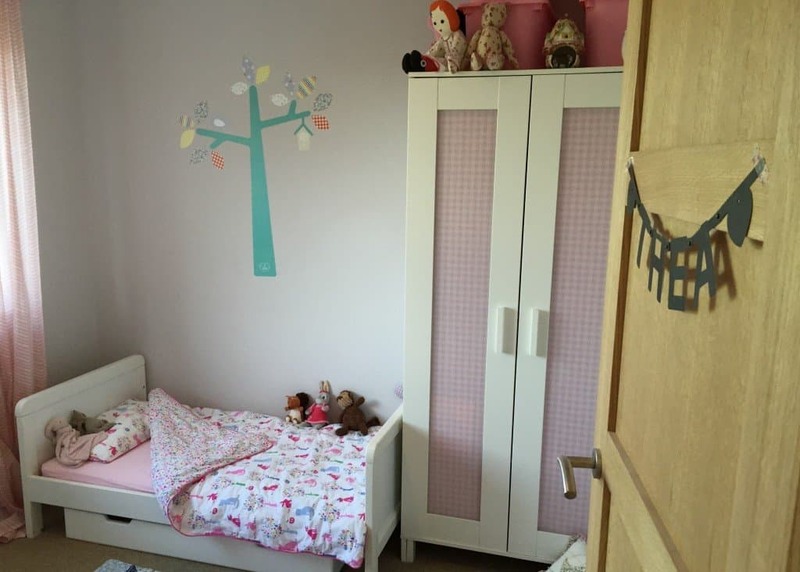 To give you an idea of the space, this was Thea’s room a couple of years ago, wasn’t it cute? It was my favourite room. 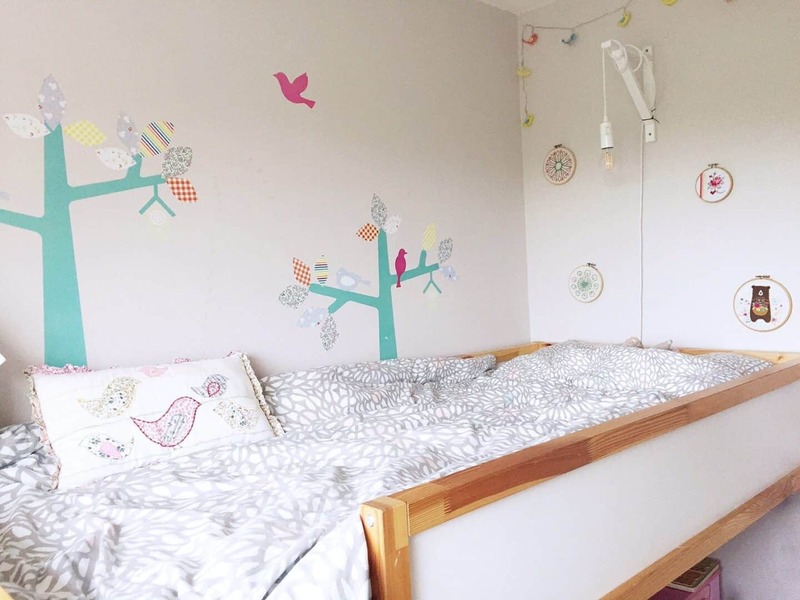 Then she had a single IKEA Kura mid-sleeper bed instead of her toddler bed. I’d always planned to make it into cute little house bed, but we never got round to it. 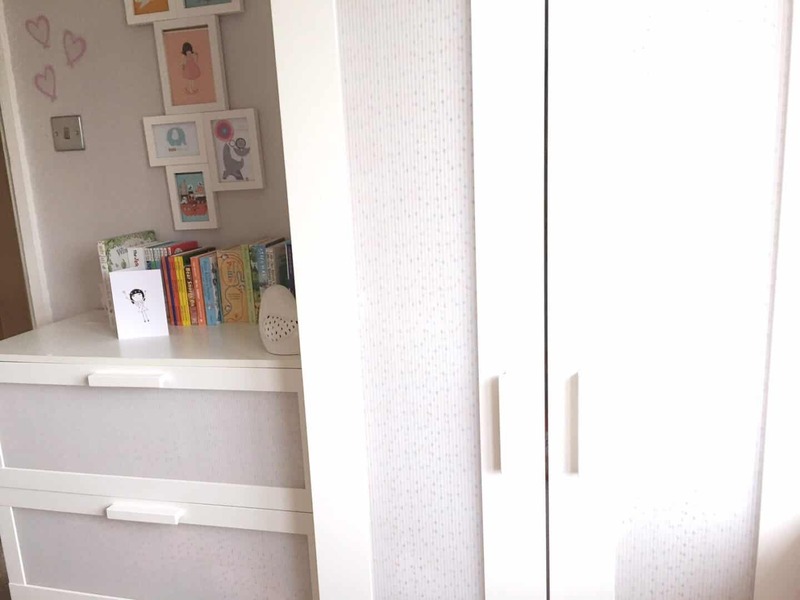 We managed to keep her wardrobe and chest of drawers on the other side of a narrow gangway. I also gave them a quick update with some paper tablecloths, which you can read about here if you like. 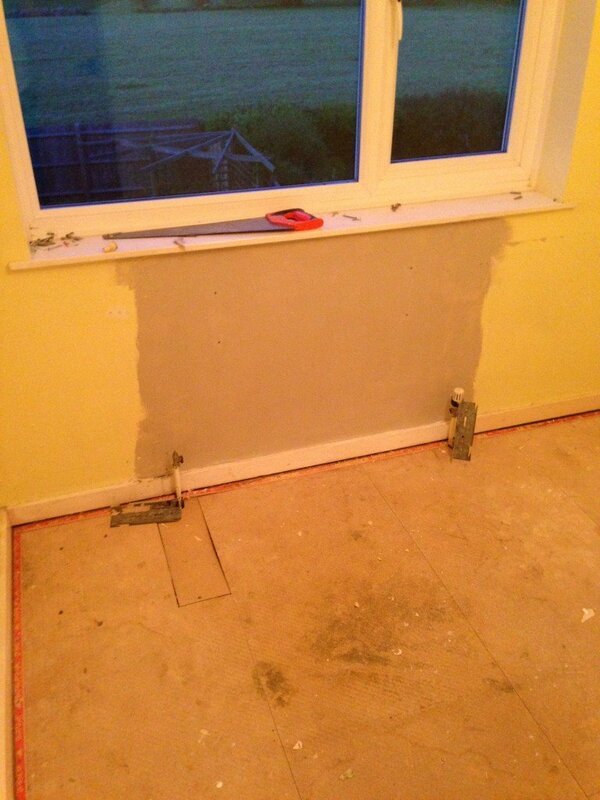 When we took off the wallpaper, loads of plaster came off too. 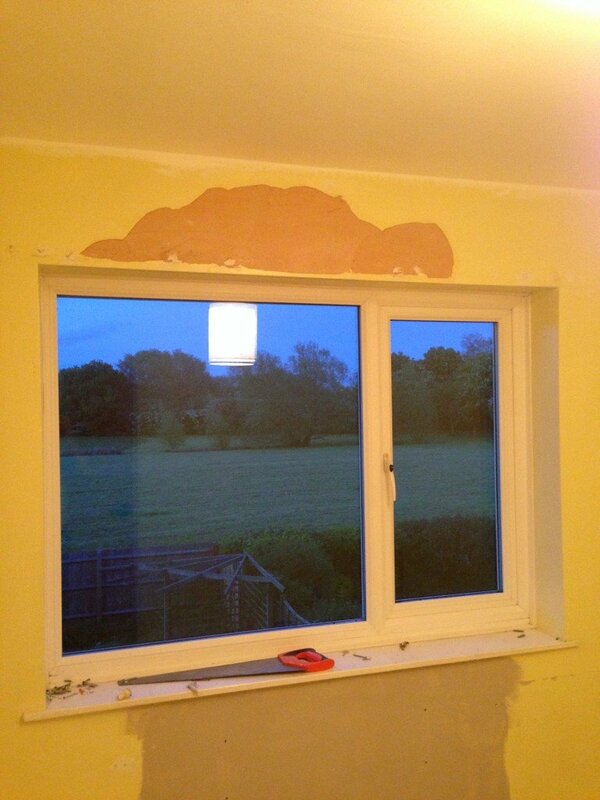 You can see the view though – the main reason we got this house! We had to scrap all of the carpets as they smelled of dog. They were really old and worn out too. Ugh it’s giving me a migraine just looking at it! We painted the room in Crown’s Spotlight, a beautiful soft grey with a pinkish undertone, and got a new carpets and doors when we moved in. Over the Easter holidays, we put Thea’s mattress beneath Ava’s mid sleeper bed, to test it out. After the initial excitement, they slept well, so when our friend offered us their old bunk beds, it was time to implement my plan! Last weekend, we gave away Ava’s bed, and she slept on her mattress on the floor. Then we took down Thea’s bed, which is now her little cousin’s prize possession. Next, we put up the bunk beds. I say ‘we’. It was Ryan and my brother. I hoovered and kept the girls out of the way! It’s hard to get a good picture as the room is so small. It’s certainly cosy! If you read my blog regularly, you may notice that this room is more colourful than my normal taste. 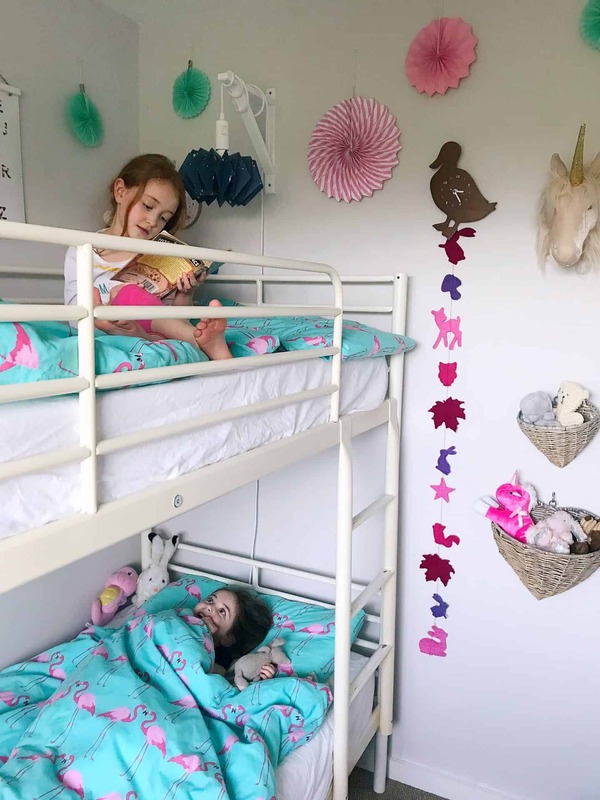 As much as I love the gorgeous monochrome kids’ rooms I see on Pinterest, once you get toys and book in there, it instantly gets colourful. 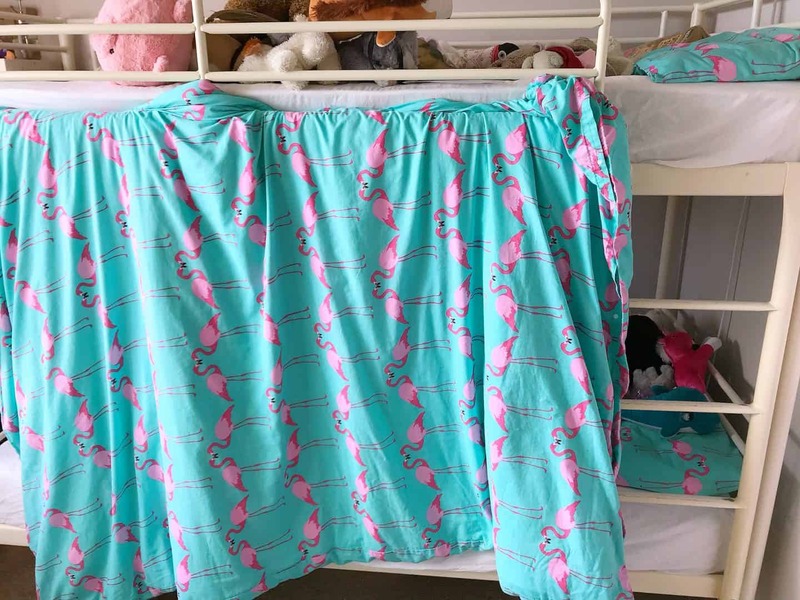 So I have embraced it and used the matching flamingo bedding I got a few years back. 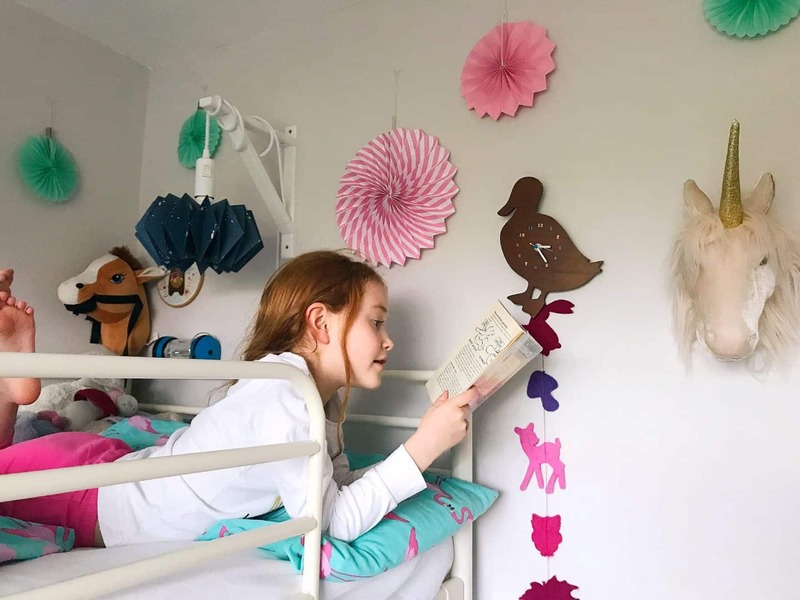 The colourful pinwheels are from Amazon – you can buy them through my affiliate link here – they are only £6.99 for 6! 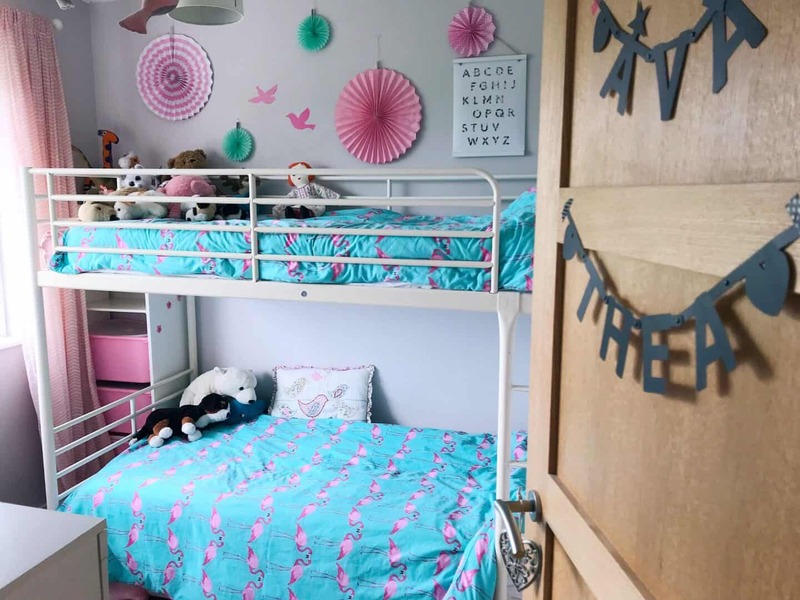 Do the Girls Like Their Shared Bedroom with Bunk Beds? The girls are absolutely loving their ‘new’ shared bedroom with bunk beds. I was worried they would keep each other up in the evenings, or wake up too early. But so far, it’s been going really well. Ava’s enjoying reading to Thea, which is a little bit heart-melting for me. Ava has a light above her, which I bought from Creative Cables, mounted on an IKEA bracket I spray painted white. It’s securely fastened in several places with white cable ties so it will not budge. I made the lampshade at an Origami Est origami workshop, and I have a kit for a matching big shade which I hope to make soon. We thought the light might keep Thea awake but actually it’s nice and dark beneath the top bunk, so Ava staying up reading hasn’t disturbed her at all. It didn’t take long for them to work out that they can hang a duvet over the rail to create a den. It’s so cute waking up to them chatting and laughing together. So I am calling this a triumph, particularly as it hasn’t cost us anything, or resulted in any waste, thanks to the joy of hand-me-downs! What a lovely space you have created! We have twin boys who share a room….and they love it. Even if it can take a little longer for them to go to sleep, its a great way for them to grasp the notion of sharing and respecting one another individual space too. Thanks Tom, I agree it’s great to help them be considerate to others, and it’s a relief they love it too! I love the transformation! My boys are sharing now and would love a bunk bed at some point. I love how grown up it is and all the vibrant colours. Also adore the black writing on the door (where are they from? )… Well done! This is def a great idea when you need more space innyour home for a playroom and more importantly it’s good for sibling bonding also. Great job! 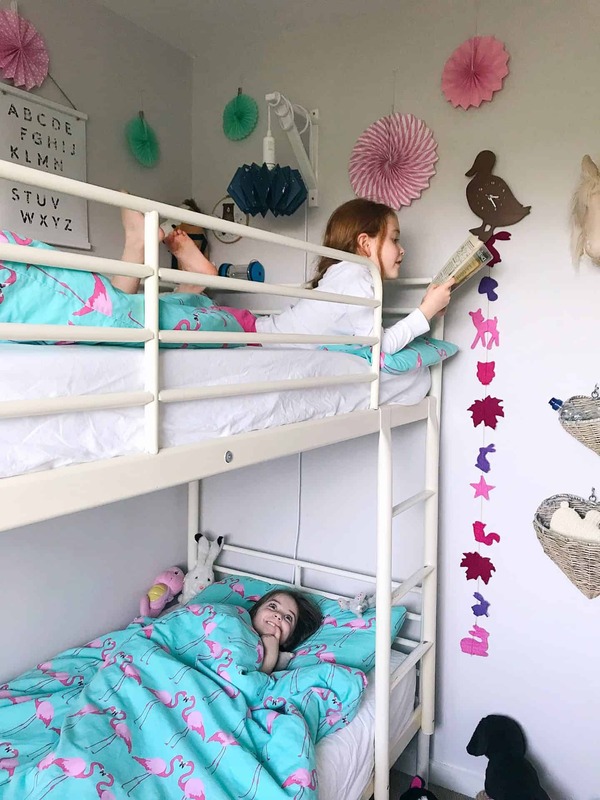 I showed this to my son and he loved the idea of bunk beds – I asked him if he thought it was for younger children and he was “NO WAY!!! I WANT A BUNK BED TOO!” hahahah, that says it all! What a lovely space you have created. Great idea to get them to share so you can have a playroom. My girls share but we don’t have an extra room to use as a playroom. The girls have the Kura actually and it works so well. Oh I love the colours you’ve used here! Those gorgeous pin wheels! Did you make them?! This is just too cute – more siblings should share. Teaches them to compromise and think about someone else first, which are great life lessons.